The above ever-common question found on many a social media site. This article will seek to provide the reader with an understanding of the conflict between the requirements of the United Kingdom government private security industry licensing and the actual requirements of the Close Protection (CP) operational environment. Since 2006, the short list of Close Protection core competencies that the SIA had imposed has seen a specialist industry be watered down to such a point that there remains zero ‘specialism’ being demonstrated. Their minimum tick-box bombshell has also seen the number of training providers explode. As a direct result the ‘CP Training Industry’ has become a booming industry, almost overnight. It has to be said that the question of training standards as a whole for CP are much agreed throughout industry – that the level is simply not where it should be. Yet, when Blogs, Articles and Posts are created highlighting the plight many actually support the SIA minimalist approach. On further scrutiny, however, all that do are in one way or another involved in CP training where their own course is the SIA 2-week duration. The above quote is probably the most accurate one that could be attributed to the UK’s government licensing authority; the Security Industry Authority (SIA). There remains much short falls and wanting of the SIA from inception to ending with all matters concerning the Close Protection sector from selecting industry advisors regarding training and testing, to its policy and its subsequent licensing procedure. Decisions appear to have been made for commercial reasons and not in the best interests of individuals employed in the private security industry and indeed, prospective clientele. It appears that industry has been the advisors to the SIA and awarding bodies and that their own commercial concerns have been placed at the front of the line. As a direct consequence of advice and recommendations from biased sources, the impact of the introduction of ‘core-competencies’ and the licensing of the Close Protection sector is negligible, and the SIA have been ignorant of the true advisors from which information should have been sought. The more the SIA thinks, the more I think they shouldn’t think more. Several years later and with no change the wheels of progress are undoubtedly grinding slowly. However, through my letter to government I had finally received confirmation that the SIA ‘had simply not set out to produce the finished article’. I came to believe that the stream of inadequate answers I received over the years to my questions was merely SIA ideology dressed up as necessity. I was aware that a main focus for the SIA was to eradicate the criminal element from the private security industry but they clearly stated at the offset that one of their missions was to ‘raise standards’. It was a ‘Ronseal’ approach, only in the light of the SIA they spectacularly failed to implement something it says on the tin. Through the SIA’s ‘minimalist approach’, they have not ‘raised standards’ but have created a benchmark that remains unfit for purpose and is one that all UK training providers subscribe. With their own agenda they kept training limited to 150 hours even though they were rightly advised for a minimum of twice that. CP training can’t be rushed. It’s almost reverent! Commercial entities speed dated in their low jinks with the SIA working in collusive behaviour – all playing for the same country club. The SIA had no compass and their ‘guide’ was ill conceived, hamstrung by a conflict of interest and biased opinion resulting in implementing a set of training core competencies that do not meet the requirements of the commercial training and operational environment. They have applied tokenism promoting the notion that there were ‘sound reasons’ for such a minimalist approach but the contagion sweeping through produced a McDonalds franchise of training providers. Let the vegetables not be blamed for the manure that enriches them! The SIA have turned something tragic into what should have been a little magic. They are in the dock with their standards for CP as ‘Exhibit A’ and the court of specialist opinion has judged them to be not fit for purpose. During the break for lunch I discussed at great length, and quite likely at much annoyance, to the SIA rep part responsible for implementing the standards. To put it simply, his response did not demonstrate an understanding of the job role requirements. The SIA is not proud of the standards they have implemented. They realise that much discontent with the standards is rife in the industry but they have still yet to grasp that CP is more than being merely ‘security’. If standards are to increase in effectiveness then the SIA needs to embrace the industry sector in the same passionate way as many of those operating in it. At present, they do not. They do not understand the job, the methodology of working practice and what is and what is not required. They have consulted with individuals and companies with a vested interest and biased opinion. As a result, attendance at meetings with them 4 years down the line sees discussions of basic requirements for the street when these should have been conducted immediately. 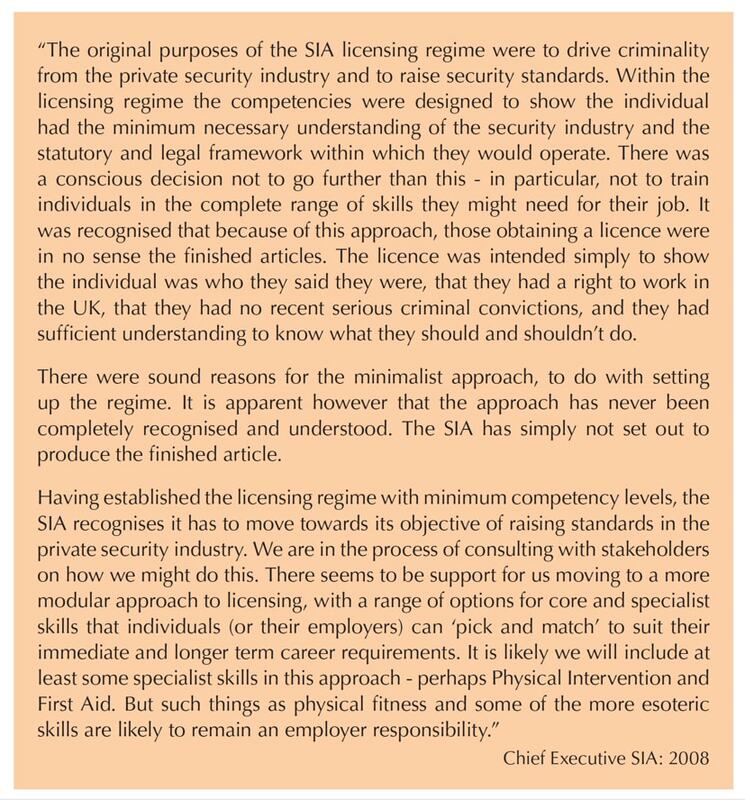 It would appear that all licensing criteria is organised to accrue the largest possible revenue for both training providers and SIA, and without satisfactory answers to questions posed will result in the SIA operating without the level of transparency one expects and who one is assured. As immediately identified during the licensing implementation in 2006, the SIA model is simply not working. The practise of leaving the responsibility of important CP role functions to the decision of the training provider and limiting the course in terms of training hours and training objectives has proved to be dysfunctional. Competition and market forces compel training providers (TP’s) to stick with the unworkable SIA minimum. To move away from the norm with the aim of increasing standards increases the overheads and the costs incurred passed on to the student in comparison to others. Any TP wishing to increase standards through inclusion of the SIA omissions remains a gamble for them in terms of profit and business sense. The competition provides a SIA license after their course so where is the incentive for a TP to increase standards and for the student to purchase that more costly, but more effective product for that same license? One would have you believe that the SIA model is solely for the UK environment. This maybe so, yet UK based contract service providers serving contracts abroad are insisting on prospective employees to hold a SIA license. The reasons being that those applicants have already passed a vetting process and criminal records bureau check thus reducing costs in their HR departments, together with the tendering process in stating that all of their employees are holders of government recognised CP licenses. The actual content of a SIA CP course is not fit for purpose for a UK environment let alone one in higher risk environments. An unscrupulous company can provide an unwitting client with a so-called CP professional simply on the basis that the individual has an SIA License. 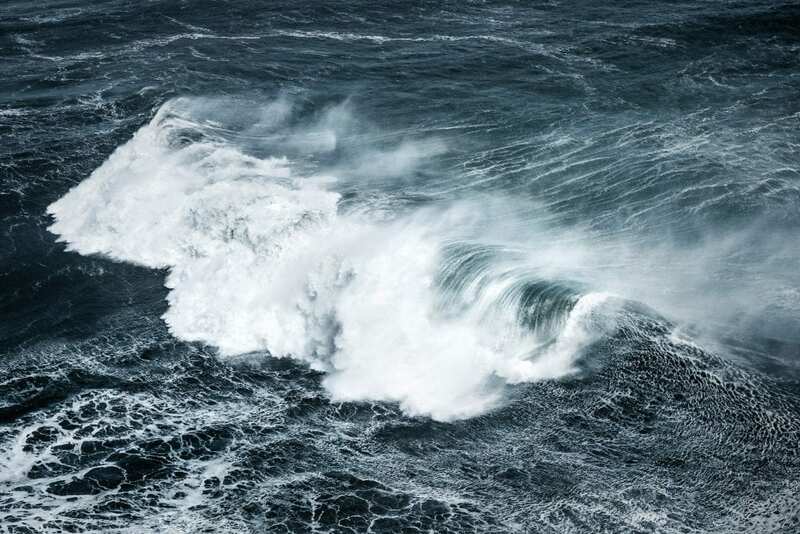 The potential for real danger in the UK on a day-to-day basis, although present, seldom arises. This gives the individual providing the service a false sense of ability and true market worth. It also provides the client with a false sense of security and a false impression that the service he/she has received has been excellent in every sense of the word including proper assessment of and preparations for risk mitigation. However, had the same client been attacked, they might have a different opinion of the service, if they were still alive to tell the tale that is. A worrying fact is that stood side by side, there is no way for a client to determine the capability and experience of their CPO if their judgement is made simply on a SIA badge anyone can get of they can afford it. It becomes a somewhat obvious stance that the effectiveness of the provision of a security service and the tactics, techniques and procedure adopted is solely reliant on the calibre of the individuals providing that service. The previous training and experience of those individuals naturally determines this ‘calibre’. Unsurprisingly then, if training standards are mediocre or even, ‘unfit for purpose’, as currently experienced, then likewise, the resultant performance of those individuals will match it hook, line and sinker. The operational environment is no place to learn the basics of providing protection but is the place to perfect the skills learnt, albeit in a team environment. If those skills are left to the decision of the training provider of whether those skills will be taught or not then they will not be – on that same basic course. ‘Real’ operations are no place to learn the trade and no place for the Principal to be afforded protection by ‘trainees’. If this industry is serious about raising standards to ones that are fit for purpose then its input needs to be a little more than three and the words Advanced should be used in the full context of their meaning. The NOS should also be grasped with both hands in applying the content and until that is done, this specialism will remain very much ‘non-specialist ’ and the service delivered very much under par. It has to be said that throughout the world the effect of commercialisation of business insofar as profitability, market forces and competition, remain detriment to the end result of that trainee. 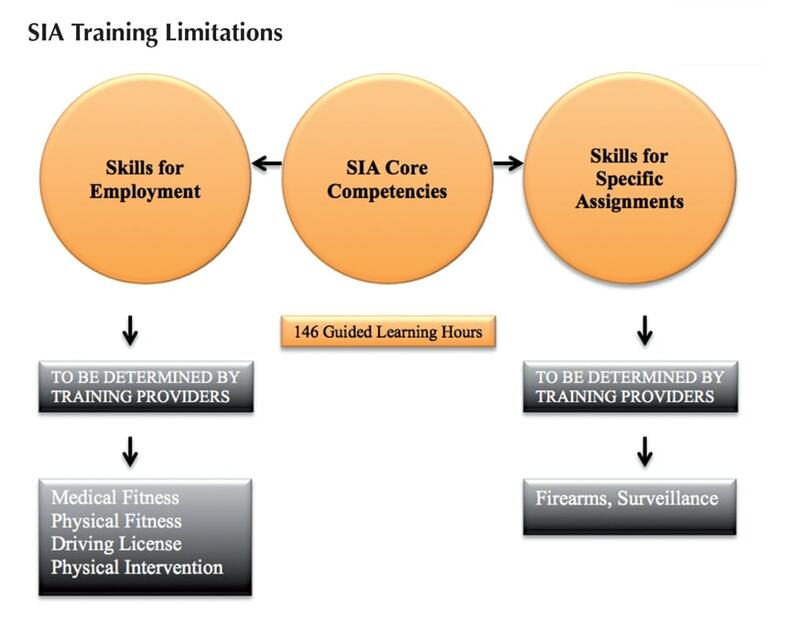 Compounding this further, the SIA dictates the implementation of a form of a two-tier training process. Due to UK CP licensing being solely ‘geared’ for the UK environment, there are no firearms and associated high-risk skills involvement. The knock-on effect this has had on industry is the emergence of what is irksomely termed ‘HECPO’, or ‘Hostile Environment Close Protection Officer’s course. Combined with the provision of commercial security in ‘sandpit’ environments (Iraq & Afghanistan) it sees the need for specific hostile environment training requirements of their employees that the SIA standard does not meet. This is where commercial CP training as a whole, fails in delivering training required for any environment that the newly trained operator may find himself. Close Protection training has a duty to accurately reflect the environments in which those newly trained may find themselves. Providing CP in the commercial world in Africa, South America and Eastern Bloc countries or anywhere the threat dictates may indeed prescribe the carriage of weapons. Skill sets required whereby SIA CP training on their own cannot facilitate. There is no defined line in the provision of Close Protection. There should be no defined line in the provision of Close Protection training. I have travelled to many different countries and have witnessed many different ways in which those countries afforded their own style of protection to their Principal’s. For the most part, that protection was overt. It was ‘Hollywood’, it was textbook and it was predictable. Choreographed movements and positions disregarding any immediate presence of any threats, or not, becomes a state of disproportional reality. Unfortunately, it is this ‘disproportional reality’ that is so often witnessed within the commercial CP environment. BG’s that are merely going through the motions without thinking. At present, this perhaps, may very well illustrate a difference between those that are government trained and those that are not? It can remain a difficult task to change the mind-set of those delivering protection training and those providing it. The common theme throughout the world of the same textbook drills and of the same textbook positioning is, for the most part, neither effective nor appropriate. 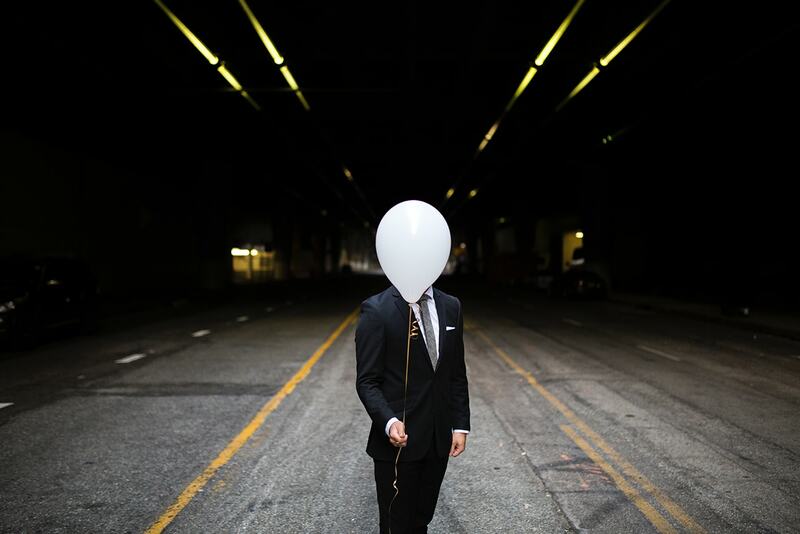 The threats experienced by most operations are initially covert. They are unseen, they are hidden and they are clandestine. If protection does not involve detecting those threats that are unseen, hidden and clandestine then their presence remains merely as a reactionary one. When those covert threats become overt attacks then any reaction is on the wrong-foot. Poorly positioned, unaware and taken completely by surprise. If protection operations do not consider and adopt covert methods of deployment in detecting those threats then the operation will be watched, weaknesses exposed and attack options determined – with much ease. Imagine for a moment if all CP training providers decided to deliver a proper fit for purpose course that is 8-weeks duration and caters for all situations a CP operator may find him or herself throughout the world; do you believe that there would be zero students forevermore? Of course not – like universities for anyone studying in order to be an Aeronautical Engineer, a Doctor, a Lawyer, they devote personal expense and time in order to fulfil their ambition. The end result is a properly trained individual in their respective profession. So, what of the answer to the original question; “Which training course should I attend? For the most part, it remains a case of choosing the best out of a bad bunch. 99% stick rigidly to the SIA standard. In an ever-increasing saturated industry that is already over-subscribed, employment competition is fierce for the newcomer. Yet, how is one to differentiate out of the in excess of 210 SIA CP training providers? My advice is to not listen to the wealth of excuses that various training providers produce – including with the narrow sightedness of ‘UK only’ work – but to train as best as you can. Do you want to be one of many two-week course attendees or prove that you can uphold the highest standards available? Close Protection is a fascinating role with possible serious over-tones if not conducted properly. If you are serious about producing the correct and effective standards on the ground – in any situation for a client then you need to be serious about attending the best possible course. If that course is government level then the evidence is clear as to the ‘Who’.